Commentary on the ISO committee response to Stephen Bounds’ recommendations for improving the KM standard. In Part 1 of my evaluation of the ISO 30401 standard, I briefly discussed how it evolved through a number of iterations since 2015 and specifically identified the changes made to the standard since a draft was made available to the public for comment and review in late 2017. Up front, I note that the overall editorial changes are a significant improvement in their own right. Redundant text has been removed, headings are clearer, and the overall document is more cohesive and readable. Most of the remaining awkwardness apparently rests in the mandatory layout requirements of ISO standards (for example, having significant text relegated to “Notes” or “Examples”). Many of the notes added throughout the standard provide sufficient detail and examples to (and especially the notes about human and group dynamics and behaviours) are very important here, since they will help to avoid any narrow reading that a KMS should be technological only. 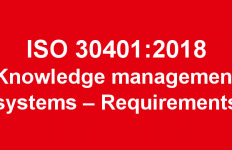 While some risk remains that ISO 30401 will be used by managers to narrowly interpret “what knowledge management is”, this hasn’t happened for ISO 9001 and I don’t see it as a likely risk here. The standard now explicitly references the role of KM in “solving problems”, and how it “supports the efficiency of processes and contributes to their enhancement, creates resilience and adaptability [and] creates competitive advantage”, both very good improvements. It also expands the concept of knowledge loss to include organisational change, which recognises the critical embodied nature of knowledge in many organisational structures. knowledge entrepreneurship — funding 3M-style innovation with active research into new knowledge; acknowledging the existence of the ISO 50501 may be sufficient for this component. the rarest case numerically (but often quite high profile) is seen in organisations that specialise in knowledge entrepreneurship – generating new and novel knowledge specifically to commoditise them on the markete (such as research firms). Generally speaking, organisations focused on different knowledge outcomes will need significantly different KM strategies. I still would have liked for the standard to encourage taking this into consideration, but it’s not a deal-breaker. All references to KM culture are retained in the standard, and this is probably my single biggest objection to the published standard as constructed. The first problem is that explicitly calling out a “knowledge management culture” encourages utopianism, the idea that “all we need to do is change the culture” to fix everything. As discussed in a separate article, culture is actually part of a trio of factors that influence organisational activity – the others are social structures (roles) and individual personalities. ISO 30401 doesn’t consider the possibility that without changes to organisational roles & responsibilities and the personality type mix, any suggested “KM culture” may be simply implausible to implement. This leads organisations on a utopian path with no reasonable prospect of success. The second problem is related to the first. The standard presupposes certain things about KM which I do not believe to true; for example, the standard asserts that if “connections and knowledge activities are encouraged, and knowledge is valued and actively used, [this] will support the establishment and application of the knowledge management system”. This requirement is problematic because it places KM systems “above the line” from the perspective of workers and, for example, is only likely to work in organisations with pretty well educated workers. I am not convinced that active discussion of KM with staff is necessary; indeed, I believe that in many organisations, discussions of how to optimise systems from a KM perspective should legitimately be limited to management-level discussions. By way of analogy, doctors don’t need to explain the training and methods behind their diagnosis to all their patients. The committee adopted this recommendation. They also removed the definition of “learning organization”, which I was less strongly opposed to but also endorse. Despite only changing a few words, the committee sufficiently reworked the headings and structure of section 4.4.3 (and also removed references to knowledge life cycle – see below) to weaken any perceptions that the standard endorsed the use of SECI as a primary tool for KM systems. Recommendation 7. Remove all references to “knowledge life cycle”. Knowledge does not have a fixed life cycle in the linear way which is implied by the term. Knowledge is intrinsic to the situated environments and organizational boundaries of one or more intelligent agents and their associated information systems. Knowledge is a dynamic response to the experiences of being in that environment. Instead, refer to “knowledge processing interventions” as a method of altering the ongoing knowledge dynamics of the system in question. The committee has softened the language around “life cycle”, now simply referring to “knowledge activities”. I still believe KM’s unique value proposition lies in its holistic approach to intervening in complexity and systems dynamics and would have like more language to that effect. However the standard no longer prevents practitioners from taking this approach by mandating a linear model. This is reinforced by note 4 of section 3.4 which specifically points out that “A system can include human and group dynamics”. As with recommendation 7, the standard is largely silent about the importance of systems dynamics in effective knowledge management. I consider it a missed opportunity to prompt implementors of the standard to think about organisations as more than just a traditional command and control role-based structure, but it’s not the end of the world. Unfortunately the standard still permits unmeasurable objectives in 6.2(e). 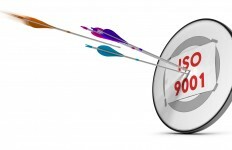 As Nick Milton points out, this is unfortunately a non-negotiable part of the ISO management systems standard. I think it would have been useful to provide more guidance on methods for effective measurement, since this has been troublesome for past KM programs. Even where benefits are indirect or diffuse, I would still like to see all objectives having defined measures, even if just as an activity based metric linked to a documented hypothesis about the expected benefit. The committee agreed to include a paragraph referring to improvements in “safety, time, risk, quality, cost, market share, [and] customer experience” in the final standard. I would have liked more discussion about effective benefits evaluation since this is known to be a persistent bugbear of KM, but overall – thumbs up. As with recommendation 7, 8 & 10, the language of system dynamics is largely absent from this standard. No doubt the choice of the committee to avoid imposing a specific framework for the standard played a significant role here. Would have liked to be more but the standard isn’t incompatible with a CAS-based approach to system design and interventions. Overall, the standard has been significantly improved since its draft form. While I still have some concerns, they are not in prescriptive areas which means that the standard won’t actively inhibit implementation of innovative approaches to KM. That’s great, since it allows us to continue to evolve the evidence base and recommendations for implementing on KM without being contradicted by an out of date standard. 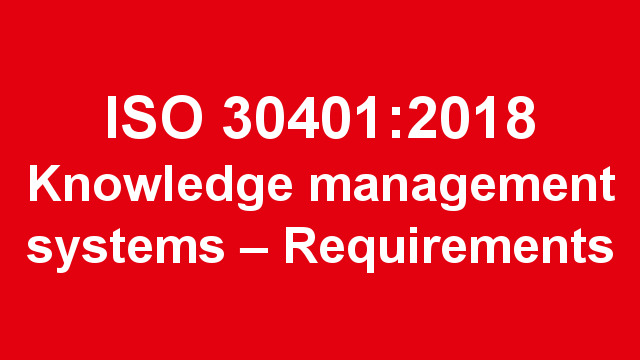 Part 3 will look at the mandatory requirements of the standard with a focus on summarising what you “must” do to implement a ISO 30401 compliant standard. Thanks for your apreciations, was very interesting read.